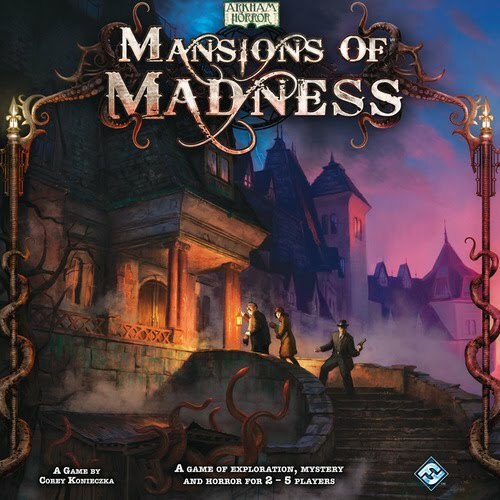 It’s fair to say that Mansions of Madness is a hybrid descendant of Arkham Horror and Descent. A team of Investigators teams up to unravel the foul plot of the Keeper in what becomes easily the most true to source adaptation of an RPG distilled into a board game. Years ago, when first playing the Call of Cthulhu RPG I, as the Keeper, ran a group of investigators through a haunted house mystery and it felt a lot like a game of MoM. This is a story and adventure style game, players stuck on winning and ‘gaming the system’ should be advised that what they’re getting into is more of an experience played for the ride, not for the victory. At its core, MoM is a crazy mishmash of a lot of little systems. For starters, each of the 5 included scenarios has anywhere from three to six different story choices that the Keeper makes prior to setup. In this, the game creates hundreds of different combinations of story elements so the same setup story has different goals, item locations, and victory conditions. It’s fair to point out that this game has a rather long setup time. Building the mansion itself is one of the easier aspects of the process, though it can be hard sometimes to differentiate one tile from another because the artwork is often a muddy brown with some very ‘samey’ qualities. Fortunately, the setup guide names them clearly to assist. Once the story choices have been made the real work begins. Story specific events and clue cards have to be retrieved. The keeper has to pull out a set of exploration, obstacle and lock cards exclusive to the scenario and then, according to his story choices, seed the board with these cards in specific order in specific rooms. After that a set of Mythos cards (Keeper actions) has to be assembled according to card symbols so they stay relevant to the particulars of the scenario, as well as a few always-available actions for the Keeper. Players, meanwhile, have a much simpler task of selecting characters, and from there have a set of trait cards they get to choose from. This gives the character some sort of starting equipment or spell and, usually, a once per game action. Investigation is the key for players, since they start the game with just a brief “Story so Far…” synopsis they have no idea what the mystery is, or how to win the game. To accomplish this they must explore the mansion in search of the clue cards hidden by the keeper. Players are limited to a single action, be it explore, run, attack or an action granted by a card ability. I felt like the players in my test games seemed a little overwhelmed on their first few turns because there were so many questions and no idea how to answer them. Once they began to encounter the obstacles, however, the systems began to fall in place. Lock and obstacle cards prevent investigators from entering rooms, usually requiring some sort of item to have been located or puzzle to be solved first. For me the puzzle aspect, while thematically immersive, is the single greatest speed bump in the game. It takes some time to figure out what combination of swapping, rotating and replacing will complete a puzzle. This creates a bit of downtime the other players usually fill by attempting to help the puzzle solver, something they’re not supposed to do. Eventually the hidden clue cards will be discovered, along with all manner of weapons and items to help fight of the Keepers attacks. Hopefully, if the players are listening to the hints on the clue cards, they’ll be pointed in the right direction to complete the scenario. Keeper turns, I found, were generally quick. The turn starts by collecting one threat token for each Investigator. Fans of Fantasy Flight’s other games will recognize that this system was lifted entirely as-is from Descent, and it works well here. These tokens are spent on the scenario specific Keeper actions. Actions available summon monsters, move said minions around the mansion, or draw Mythos and Trauma cards that generally mess with the characters minds and well-being. Since monsters can only be summoned and moved one at a time, by spending threat, this works well to keep the Keeper from overwhelming Investigators with a swarm of creatures. The last thing a Keeper can do is attack with all monsters that are in a player’s space. Finally, to end the turn, a Time token is placed on the event deck, and when the requisite number of time tokens has been collected an event is triggered. Event cards act as a turn timer, pushing the story forward. Early events trigger happenings in the mansion, moving monsters, providing clues to the greater mystery and, sometimes, more resources for the Keeper. The 4th event card reveals the victory conditions. The 5th action card ends the game, whether the players or Keeper have achieved victory or not. Perhaps the more unique aspect of the design is the combat system. Attacking Investigators don’t simply roll a skill and figure damage. Instead, the keeper draws combat cards, specific to the type of creature being attacked (either Humanoid, Beast or Eldritch) and draws cards until reaching one that matches the type of attack the character is using (ranged, sharp or blunt melee, unarmed) . From there, an attack is described for thematic purposes and a skill test is listed. I like this, because the skill rolled can be any skill the character has, preventing certain characters from being unbeatable in combat or worthless in combat. Attacks originating from monsters work similarly, cards are drawn until the proper one is found (monster attack, monster vs. hiding, monster vs. barricade) and the instructions are followed. Sometimes this triggers a special attack that is hidden on the bottom of the figure’s base. Again, this system works for me because it prevents a single monster type from being super powered and too deadly to handle. Skill rolls still originate from the character and, aside from special attacks, combat effects from the decks seem fairy balanced out. Undoubtedly the frustrating aspect of combat is drawing over and over (and over) in search of a combat card matching the attack. You’ll see this especially when the monsters are attacking against barricades or hiding investigators as there are a limited number of these hidden in the deck. Trauma cards are a wicked little trick in the Keepers arsenal, they appear as madness or injuries and may be played when an Investigator suffers a sanity or health loss. They can create skill check penalties, kleptomania, or even cause a character to unwillingly run right into danger. Mansions of Madness features thematic, immersive gameplay that does fair justice to the Lovecraft Mythos. In traditional FFG style it also seems designed for expansions so as the game content grows I’d expect replayability to remain strong. I tend to like expansions for a game like this, so I consider that a positive, though some might see the opposite. There were a few misprinted cards, and while corrections were included in the box, this same sloppy proofing made its way into the rulebook. There is already a two page Errata and FAQ sheet on the FFG website, full of frustrating rulebook and card misprints and rules clarifications that you wish had made it into the actual rulebook. A revised rulebook in PDF would be the least you could do, guys. In addition, the box is extremely cramped. I’ve never been one to stuff components randomly into the box or hide the figures under the box insert, so I had to place them in a storage box. It almost makes me wonder why this didn’t end up in the famous FFG “coffin box”. With expansions certainly on the way it would be nice to have plenty of room to grow into. an errata insert, yeah, never a good sign. Despite a few awkward and annoying flaws, I’ll chalk this one up as a success.